Neutron stars are the remnant cores of massive progenitor stars, and contain the most extreme states of matter detectable in the Universe. While much effort has been expended on examining matter at extreme densities and temperatures in terrestrial environments (e.g. experiments such as the Relativistic Heavy Ion Collider, LHC, etc. ), neutron stars offer us a rare glimpse in how these states of matter occur in nature. At the extreme densities found inside neutron stars, atoms are so densely packed together that new states of matter can exist. While neutron stars are extreme environments in themselves, it is possible for matter to transform into something even more exotic through an increase in density. The main example of this is quark deconfinement, in which fundamental particles (e.g. electrons and neutrons) break down into their constituent quarks. Quarks normally don’t exist as free particles, but this can happen under the extreme temperature and densities at which quark deconfinement occurs. In the strange quark matter hypothesis, a quark star could result if quark matter is more stable than ordinary matter (Fig. 1). Fig. 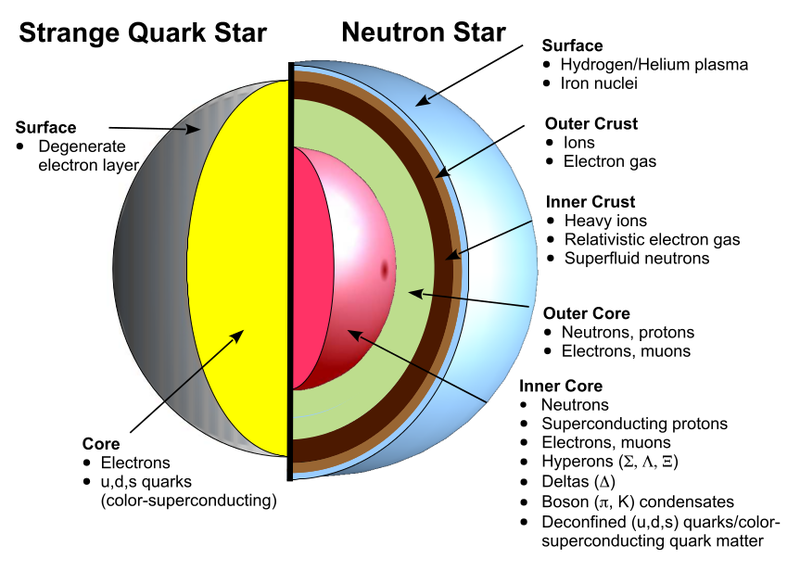 1: The predicted structures of a quark star and a neutron star. Neutron stars usually spin at high rotational frequencies (which we observe as pulsars), and this rotation can also induce interesting changes in its structure. A large rotational velocity can alter a star’s core density through centrifugal forces (i.e. a faster spin leads to a decrease in density). This change in density can lead to a phase transition between baryons and their constituent quarks. The resulting transformation in the state of matter will change the star’s moment of inertia. A different moment of inertia will subsequently affect a neutron star’s spin rate, causing a spin up. Normally, neutron stars spin down over time, and thus their central densities increase slightly owing to a lack of centrifugal forces. If this scenario occurs, we should be able to observe a sudden increase in a neutron star’s spin rate, an effect known as “backbending”. By examining the braking behavior of pulsars over time, it might be possible to detect signs of quark deconfinement occurring within the core. The structure and composition of neutron stars can also be affected by their magnetic fields. Neutron stars are likely deformed into oblate spheroids due to the extremely strong magnetic fields they produce. This resulting oblateness can increase the maximum mass of the neutron star that can be supported by neutron degeneracy pressure. While lots of theoretical work has been done in modeling the structure of neutron stars and quark stars, much of this is yet to be observationally verified. Future data from telescopes like such as the Chandra X-ray Observatory and ground based detectors such as the Square Kilometer Array (SKA) will provide insights into the physics of these extreme objects. If the strange matter hypothesis holds true, the transitional state between a neutron star and quark star (known as a quark nova) could explain the origins of gamma-ray bursts, production of certain heavy elements, and anomalously luminous supernovae. Finding the Helium Flash Dark matter and the Solar Interior Spinning pair-instability supernovae The Radio Burp from Dark Matter’s Lunch? Would the sudden spin up of a neutron star necessarily prove that it transitioned to a quark star state? Or are there other mechanisms that could give the neutron star extra angular momentum?